Easily one of the best hostels I have ever visited! 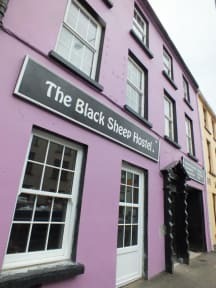 Black Sheep Hostel is extremely cozy and the smell of burning wood from their fireplace will welcome you in from a damp Irish evening. Their two dogs, Bob and Lou, are equally adorable and give the place a homey feeling. Try to stay on a Tuesday when they prepare an optional, shared meal for a small cost — you'll meet some new friends and create some amazing memories with guests and locals alike. Really cool hostel with a friendly staff. Location is great! I loved my stay at the black sheep! I felt like I was being welcomed into a families home. The staff were very friendly. The beds were extremely comfortable and the room felt very clean. The atmosphere is very relaxing and open. I miss it already and will be returning as soon as possible. Amazing hostel! One of the best i’ve been in. Great location, just near the national parc of Killarney and near the centre! The staff is great en very helpful! The beds are very comfortable! I definitely enjoyed my stay ! This place was great. I felt very comfortable in the hostel. The breakfast is very wholesome and the staff are lovely and helpful. There is a lovely common room with a fire place which i loved! Great people, and there are 2 dogs, Bob and Lou, who I love! And a wood burning fireplace. Very cozy! By far the nicest hostel I’ve stayed in! The staff are extremely warm, welcoming, and helpful. They have bikes for rent and free parking if you’ve brought a car, as well as a lovely garden and sitting room to socialize in. I would, without a doubt, come back again. The beds here are the most comfortable beds I've ever stayed in at a hostel! They also have blackout curtains around all of the beds which are amazing! The kitchen facilities are great if you're interested in making your own meals. The hostel is strict on quiet hours after 11pm which is nice for sleeping. The staff do a nightly family dinner but its not open to guests and felt a little alienating. The location was great for hiking in the national park! Also, Jacob who works there is AMAZING!